Carbon dioxide, a potential fingerprint of life, has been discovered for the first time in the atmosphere of a planet orbiting another star. However, the planet, HD 189733b, is too hot to be habitable. But the discovery nonetheless has scientists excited, because carbon dioxide is one of four chemicals that life can generate, so being able to detect it shows that astronomers have the ability to find the signs of life on other worlds. "This is the first detection of carbon dioxide in the atmosphere of an extrasolar planet, which means that three of the Big Four biomarkers for habitable/inhabited worlds have now been seen: water, methane, and now carbon dioxide," explained Alan Boss, a planet-formation theorist at the Carnegie Institution of Washington who was not involved in the finding. "The only one that has not yet been detected is oxygen/ozone." Boss told SPACE.com that the detections provide "proof of concept" for what astronomers would search for in looking at an Earth-like world. The detection of carbon dioxide, Boss said, was made with a low degree of resolving power, the sort that could be provided by NASA's planned Terrestrial Planet Finder. HD 189733b is about 65 light-years away. 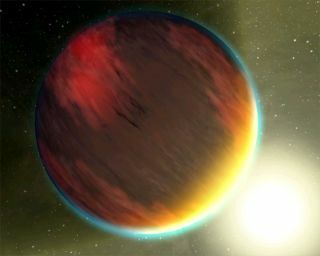 It is a giant, gaseous world known as a "hot Jupiter" because it orbits very close to its host star. The finding was made by Giovanna Tinetti from University College London, UK and her colleagues, according to an article in Nature News, an online publication of the journal Nature. The researchers measured the spectrum of light reflected from the planet's day side by using an interesting trick: They recorded the light of the planet and its star, then recorded it again when the planet was hidden behind the star. The difference revealed what light was coming from the planet, which is otherwise impossible to see as a distinct object because it is overwhelmed by the light of the star. Astronomers aren't sure why HD 189733b has carbon dioxide. It could be that since it is so close to its star, intense radiation is breaking other chemicals down to create the gas, according to an article in the online edition of the magazine Science News. The detection was made using the Near Infrared Camera and Multi-Object Spectrometer (NICMOS) on the Hubble Space Telescope. The results will be detailed in the Astrophysical Journal.